New exhaust mani option? 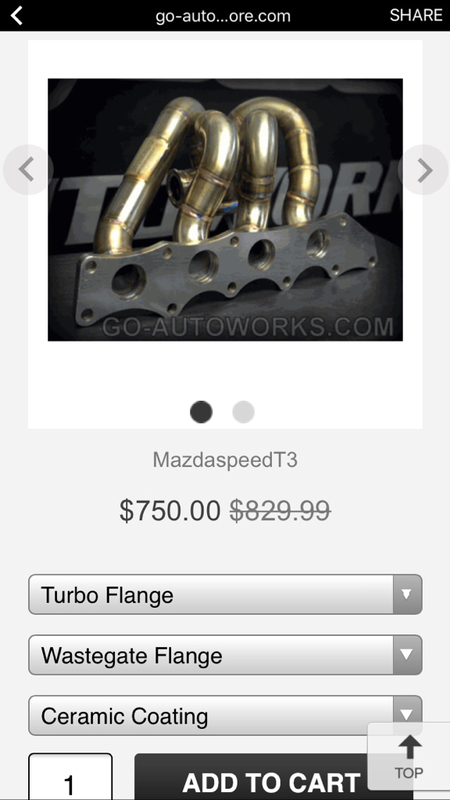 | Mazdaspeeds.org, The New Era in Mazdaspeed, CX-7 & Ecoboost Forums! Discussion in 'Mazdaspeed 3 General Discussion' started by stg_ms3, Feb 14, 2017. Saw this on the BNR Facebook page today. Anybody heard of this company called go-autoworks before? Apparently he's a buddy of Bryan. Looks good. I can't speak to it's ability to withstand cracking, but it's nice to have some more options. I bit the bullet and decided to buy this manifold, mating it up to a Precision 5862. the turbo has a v-band flange and I didn't want to go with the cast CP-E manifold, and this one offers a v band flange, lets just hope its not a $750 paperweight. Have you gotten the manifold yet? I'm looking at one as it seems to be a decent choice for my build (I'm looking for a T3) but I was hoping to get some insight from someone who has one. Wonder how fitment is. Can you update us, @Emilio V. ? V-band options are so superior in so many ways (turbine inlet and outlet). The turbos with them tend to cost less, they flow better, and there are usually a LOT more turbo options, too. All wins. I'm curious as to the EWG design.. Hopefully it's efficient and doesn't creep like a Boost Junkyz. Havent recieved the manifold yet, I ordered it on the 6th of this month and shot them and email yesterday but no word back yet, hopefully it'll be here in the next 2-3 weeks. I've got a build thread on my page and will be posting all updates onto there. Any updates on this? Would love to know how the manifold ia holding up. Turbo back exhaust installed! NICE!